Carbon Fibre is very stiff, lightweight and strong. Because of these properties, carbon fibre is an excellent product for the manufacture of high tech cycles where strength to weight ratios can be critically important. The rigidity of carbon fibre means that it will not deform under impact, which can lead to cracking or damage to the outer surface or structure of the carbon weave. 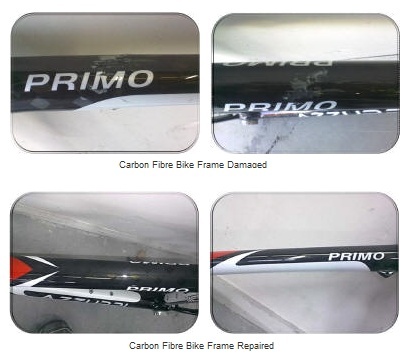 The repair process involves the removal of the damage and re-laminating the carbon using the correct weave and tensile strength. After the new carbon has been laminated under pressure, we refinish the item so that the repair is almost invisible to the naked eye. If the item is to be painted, the repair will be undetectable. we offer you a 5 year guarantee.